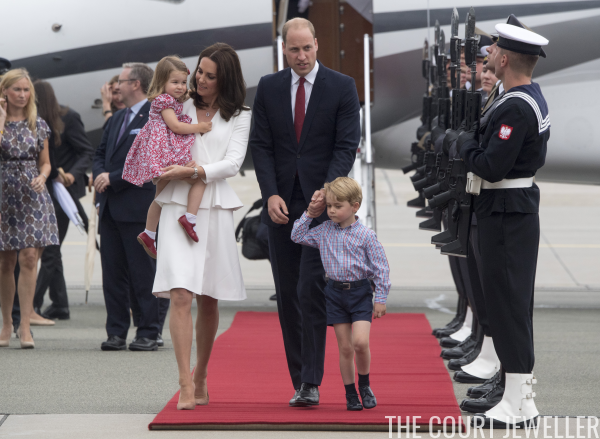 This week's tour of Poland and Germany by the Duke and Duchess of Cambridge kicked off on Monday morning with an arrival ceremony in Warsaw and several daytime engagements. 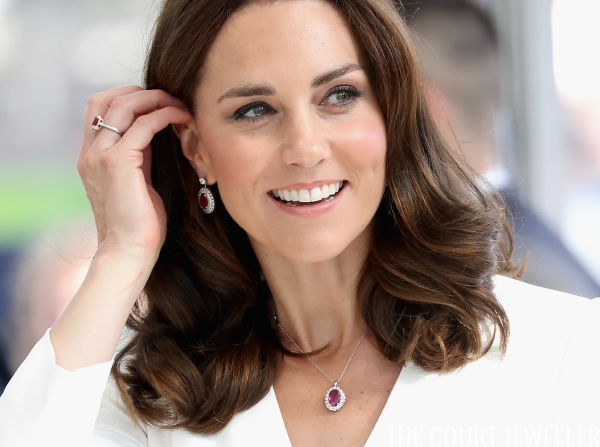 Kate echoed the colors of Poland's flag by wearing red jewels and accessories with her creamy white ensemble. Many have already asked me if I believe the stones are rubies, but I'd be hesitant to confirm or deny it. The stone in the necklace is pretty large for a ruby -- they exist at that size, but they're rare and expensive. (But hey, this is the future queen we're talking about, so it's certainly possible.) Until we get confirmation, I'm just going to say that they're gemstones in various shades of red, possibly rubies. We've not seen these pieces before in public. 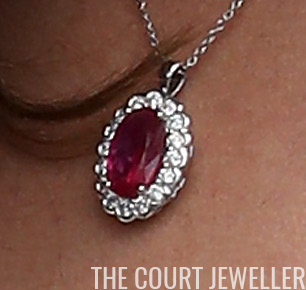 Here's a closer view of the necklace, which features a single red faceted gemstone set in a cluster of diamonds. The pendant is suspended from a simple silver-toned chain. The earrings include a large drop: a red faceted gemstone set in a double cluster of diamonds. The cluster is suspended from a single diamond stud. 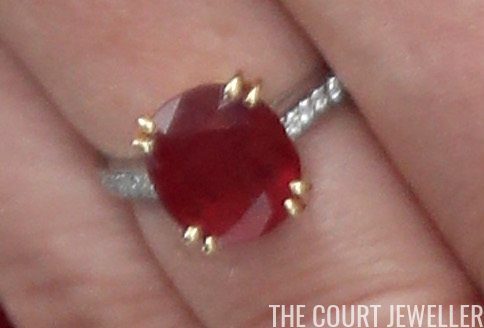 Kate also wore a ring on her right hand, also set with a red gemstone. The gemstone's setting is done in yellow gold, while the band of the ring is a silvery-white tone with pave-set diamonds. 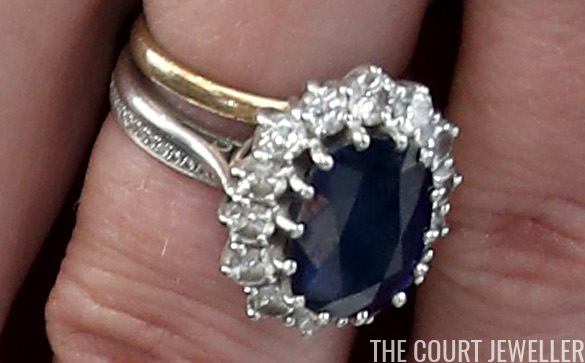 She wore her wedding and engagement rings, plus her eternity band, on her left hand. 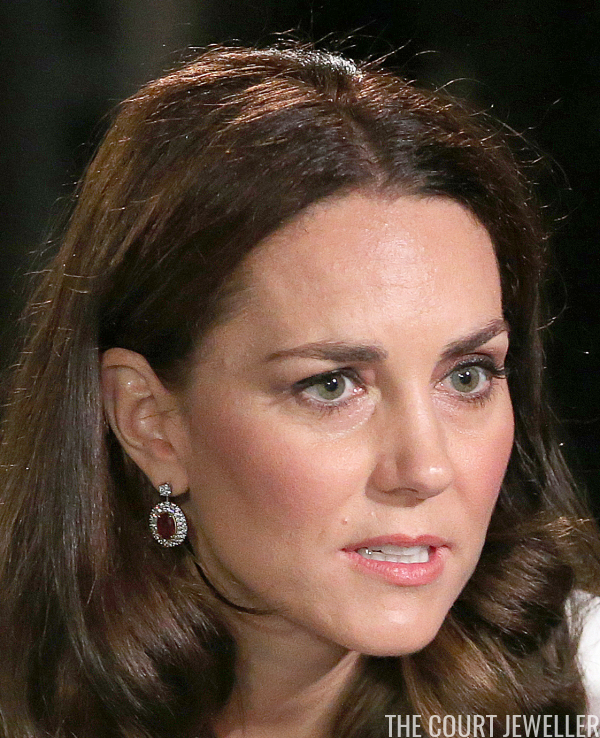 What do you think of Kate's new jewels? I don't believe these are a matched set, but rather similar pieces worn together as a sort of married demi-parure. Thoughts?